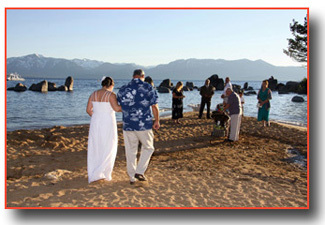 Some of the finest beaches in Lake Tahoe are found along the southern shore, and Zephyr Cove is one of the best. 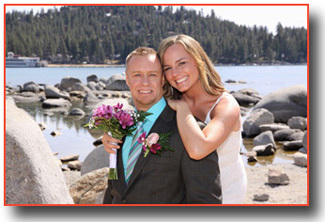 Located just a few miles from the state line in Nevada, this resplendent wedding site offers a dazzling view of the lake’s incredible sapphire colored water and the attention-grabbing Sierra Nevada Mountains that pervade the background. The imparted ambiance of this fascinating location is one of repose, and the march down the sandy aisle of matrimony will be an energizing journey to be remembered. Following a brief hike down a path through the timbered foliage, your toes-in-the-sand affair will occur near the lakefront that’s structured with eye-catching, rock configurations that contribute pointedly to the grandeur of this exceptional beach ceremony venue. As an added benefit, if conditions are favorable, Zephyr Cove is positioned to capture a dramatic alpenglow sunset, a reddish hue that pierces the clouds and emits a brilliance throughout the sky. Home to the famous M.S. Dixie paddle wheel riverboat, this magnificent site is ideal for small groups that want to enjoy a casual, informal wedding. Parking is available, but there is an entry fee per car and is somewhat limited during peak summer season (we do offer party coach limo services – see below). 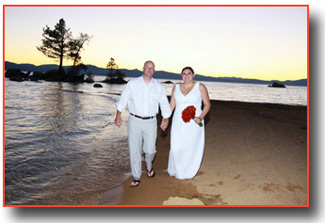 Since Zephyr Cove Beach resides in Nevada, a Nevada marriage license must be obtained. 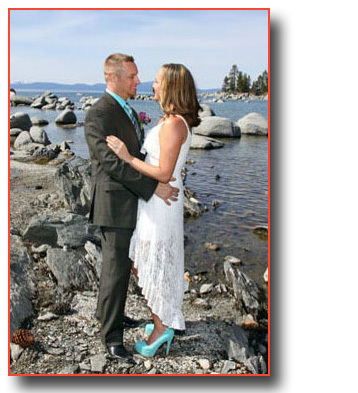 Since Zephyr Cove Beach parking requires an entry fee per car and tends to be somewhat limited during the summer months, we’ve made available a convenient limousine service that can provide you and all of your guests transportation to and from the wedding site. 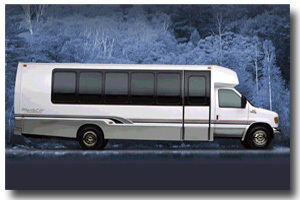 The stylish party coach offers a comfortable ride that allows those attending the celebration to arrive together and on time. Enjoy lounge styled seating and a favorite complimentary cocktail during your travels in a socially friendly environment. 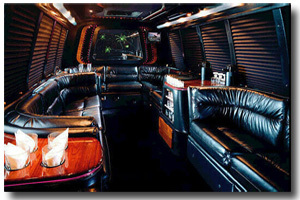 After the ceremony, your private party bus will bring you to your reception site or other chosen destination. Provided at a cost only marginally higher than traditional limousine service, the party coach is a fashionable amenity that’s a surefire way to reduce the stress on a very special day.